Using humble materials and simple techniques, you can put up any of these garage shelves and squash clutter in less than one weekend. 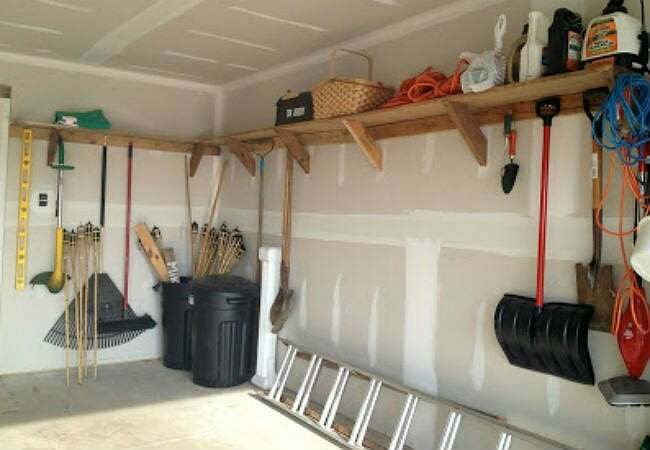 For handy homeowners, the garage isn’t simply a spot to park the car—it’s a place to park everything, including gardening gear, wood saws, and seasonal storage. 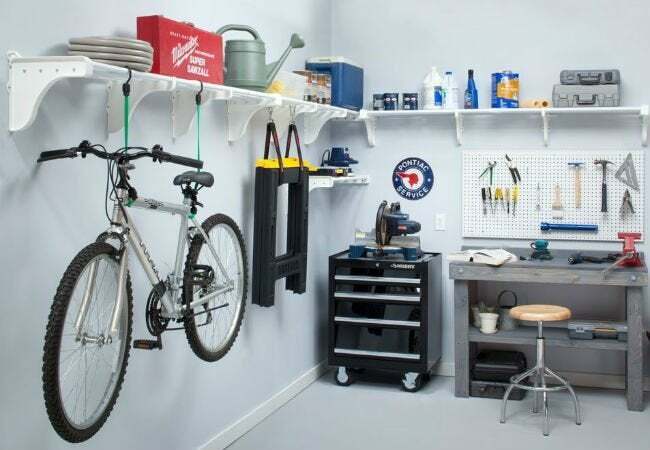 But without space-smart shelving to corral these tools and supplies, this practice can turn your good-looking garage into a disorganized drop zone. 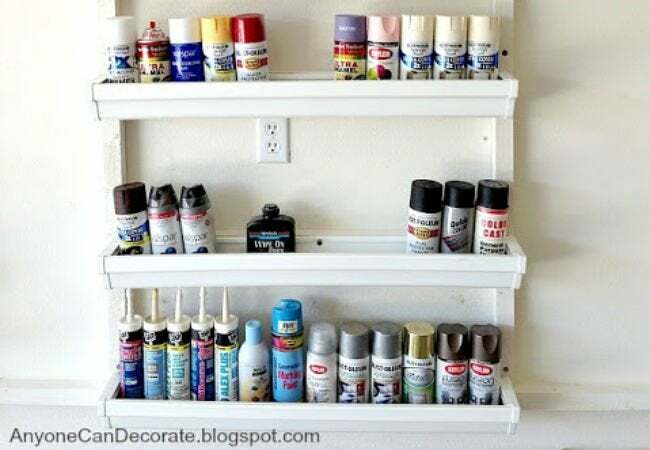 This weekend, reverse the course of clutter with one of these five ideas for DIY garage shelves that will transform your space into an organizational oasis. Do you need a designated area in your garage to store bins upon bins of seasonal decorations or sports equipment, but don’t want to spend on pricey store-bought units? Look no further than this elegant yet economical solution from Ana White. 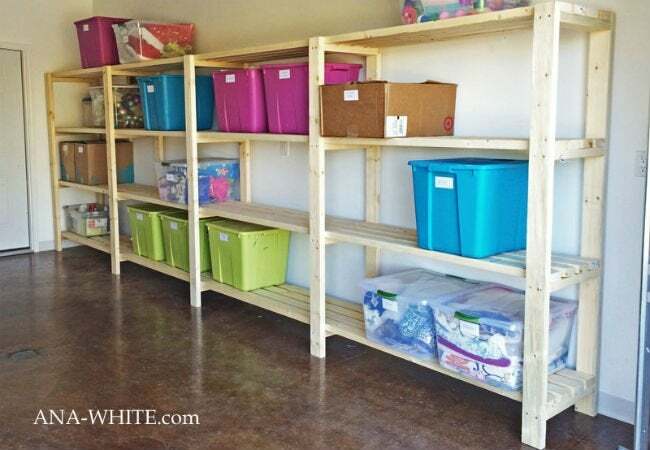 While her 20-foot-long DIY garage shelves are ideal for a space with ample square footage, you can alter the plans to make your finished product as long or as short as you need. Built from 2x4s, the frame and shelf supports come together easily with self-tapping screws and wood glue. After threading the boards for the shelves through the frame, secure the project to the wall, then sand and stain for a winning finish. 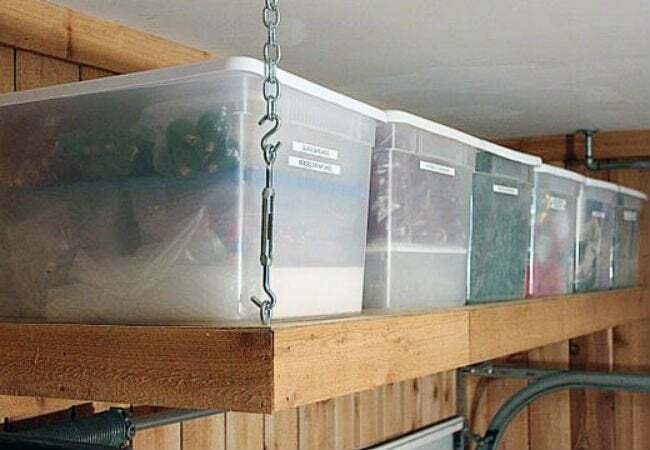 DIY garage shelves constructed from rain gutters make for standout wall-mounted storage. After building and painting a frame, the savvy blogger behind Anyone Can Decorate secured the gutters to the frame and filled the rounded bases with spray paint, seeds, and other project must-haves. Inexpensive and easy to construct, this sturdy, streamlined solution makes it a breeze to find what you need, even when you’re in the throes of a project. If the floor of your garage is already spoken for by lawn gadgets or sports gear, look up—the ceiling of your garage possesses hidden storage potential. To maximize it, follow the lead of the bloggers at The Cavender Diary to erect this simple yet space-smart hanging shelf. A thick wooden plank creates a solid foundation for the storage unit, while chains with S-hooks—secured to the ceiling and attached to the base—help keep seldom-used supplies and decor safely suspended. Open shelving is a fun and functional feature in the kitchen, and this IKEA hack from Polished Habitat proves that the look works just as well in the garage. Mounted storage cubes—often meant for the floor—make perfect homes for baskets, spray paint, and tools, and ensure that every odd and end has its spot. 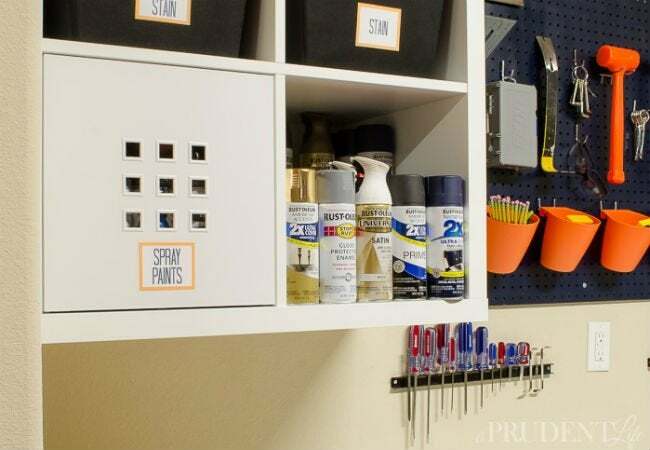 Take these DIY garage shelves up a notch by incorporating a piece of pegboard into the assemblage and tucking in a bench beneath to create a workstation fit for any serious DIYer. You don’t have to be a woodworking wunderkind to build this multifunctional marvel from Don’t Worry. Be Happy. Keep Learning. Budding carpenters and master craftsmen alike can keep garage clutter under control by screwing reclaimed 2x4s flat against the walls, then securing reclaimed boards above them to serve as DIY garage shelves. Angle-cut beams provide yet more support for the shelves, and a series of screws along the 2×4 bases accommodate rakes, shovels, and other hanging items, making this a double-duty project.